A few days ago it rained for five hours straight. And y’all, it didn’t just rain, it really rained. It was relentless; the clouds were a mixture of dark gray and purple and they moved as if they were making landfall from the heavens above. It was about time. It is technically rainy season but we haven’t seen rain for a couple of weeks. 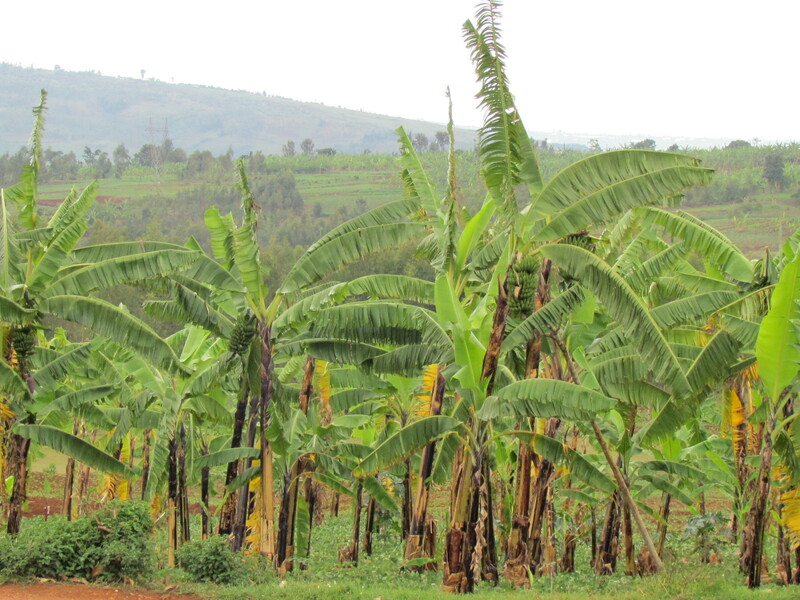 I have been able to see the nervous expressions of the farmers at market and as they walk the banana plantations en route to cultivate each morning. Currently, it is harvest season for the beans. No rain, no beans. I could almost feel the smiling faces, joy, and ardent relief from everybody when the rain came. Finally. I enjoy the rains, most of the time. I don’t really care for how the roads become muddy pits (and thus altering my run schedule immensely), but at least a water source is ensured for a short time anyway. My house – like many – has a make-shift rain catching system. Rain falls on my roof and falls into a hanging tin. If you place a bucket below this tin, voila! You have water. You can be sure that when water is pouring from this magical piece of tin, I place every basin and bucket I can find under so that I have water in as many places as possible. When this successfully happens I unreservedly can say that it’s been a good day. If rain is absent I have no other alternative than to fetch. Alphonsine (the school groundskeeper who also washes my clothes and helps with other household chores when I need the assistance) comes by, grabs the 20-liter yellow jerry can, and goes on a water hunt. In this case, I give her 100 Rwandan Francs (the equivalent to around 20 US cents). There is a water tap source about 200 yards from my house, but is not reliable all of the time. If water is missing there, we can check at the pastor’s house across the street. They have recently built a tank system that stores an incredible amount of water. However, if you are in the midst of an intense dry season, like this past summer, then the only other water alternative is to head to a small lake south of my house. It is an hour-long trip and it’s largely uphill on the way back. It sure ain’t easy. Should I wash my body or use the water to drink? Should I use this water to cook or clean my floor? Do I have enough water to at least wash my feet? It gives you a hell of a lot of perspective when these are things you have to think about. What I’ve noticed about myself and this whole water thing and really, life here in general, is just how…dare I say it…easy it has become? In the beginning, about two years ago, finding water was a scary thought. Cooking with charcoal was a mystery. Washing my feet seemed stupid. Wearing igitenge (African fabric) to respect the more conservative culture felt strange – especially if I was just going out on the road for a couple of minutes! I was intimidated to walk into one of our shops to buy sugar, batteries, salt, or some necessary material I needed at home. Walking the roads was foreign; this was not my home. But this is where life is a bit crazy. The school holiday has arrived and so I’m no longer teaching. Just like the way I started, my work-load is well…next to nothing. Free time is the name of my game. I’ve switched back to cooking with charcoal, leaving behind my finnicky petrol stove. When I moved here that was my cooking source and I abandoned it about a year ago in lieu of something less messy. I chose petrol, but the reason I am back to charcoal is because it is significantly less expensive. In this final month in Rwanda, I am with Divine and we decided that charcoal would be our preferred method in cooking our meals. I am seeking out people to visit again – just for the hell of it – and I’m cleaning my house because I enjoy it. My life is currently composed of all of the foundations that were present in the beginning. Only now, I’m so in my element. I can have a hot, fiery charcoal stove ready in 5 minutes. I embrace the free time; my house is sparkling clean. Mopping, sweeping, organizing? I barely have to think about it. I wash my body at least two times (sometimes three!) per day. Being clean is important. It’s good culture. These roads are ours now; I know the grooves and indentations in the soil (I have fallen enough times), and I know the back roads to take me to the forest, churches, or the never-ending plots of farm-land. Life is slowing down. A lot. Which is good, because the last part of my service here is closing things up, saying goodbye, and soaking up the best parts of Rwanda before I head home. That’s why I am staying, you know. Most of my group leaves in less than a week, but I elected to stick around an extra month so that I could slowly phase out of this. I’m so glad I have. Yazina and Divine, two of my girls, are living with me for the next week as they take their national examinations. They live far from the exam location and so we arranged for them to stay at my house so that they could focus on studying and not on the difficulty of commuting to sit for their exams. It’s been lovely, wonderful, and so much fun. I have really realized how much I love taking care of people in this process. We are in the second day of exams and so the girls have been with me now for a few days. I rise with them early in the morning and immediately put the kettle on to make some tea. I organize the sugar, the cups, and the bananas as they continue to read from their worn books. When it’s time to drink, we pray, consume, and Divine and I share the imigati (the proverbial “bread” that is, scripture from our Jesus Calling devotional). They then go to wash, kwisiga yo amavuta (put on lotion), and beautify themselves to go take their examinations. During exam week, they have two exams per day, and so when they leave in the morning I won’t see them again until around 4:00 or 5:00pm. Once they leave, I take time to myself to journal, drink coffee, and listen to music (currently I am obsessed with a group called Imagine Dragons). I start cooking mid-morning, and I cook a lot. Divine advised that to save time, I should cook once per day, but cook enough to make two meals. Brilliant and sound advice! I’ve been cooking macaroni, beans, rice, vegetables, and plantains. I put the food in warming containers so it will stay relatively hot throughout the day. When I finish to prepare food for the girls, I clean. I add to my growing pile of things to take back to America and also add to the growing pile of give as gifts to my Rwandan friends. Eventually, I run. This week I have also been teaching a woman in my village who has recently been accepted with refugee status to come to America. I don’t quite know the ins-and-outs of her story, but she is a Rwandan woman who has lived in Congo, Rwanda, and Kenya. All of her family will come to the United States in December and she doesn’t know any English. She practically grabbed me as I was running last week and begged for some emergency lessons. With all this free time as I wait for the girls to finish their exams, I figured, oh, why not? Afterwards, I come home, paint my nails, write more of “thank you/goodbye letters” until I hear the sounds of the girls on the road (they are easy to listen for). I go out, greet them, bring them inside, and we do it all over again. So many moments this week have been filled with déjà vu. Only this time, it’s just different. It’s like I belong, or something? And it’s better. So so so much better. Life on the roads and in the village isn’t necessarily a cake-walk. No, getting called umuzungu or being asked for money still presents all of the issues that exist when in the situation I am in. The lying, issues of trust, and all the layered difficulties that I have discovered over the months are still present too. None of that goes away – ever. But, that’s life, isn’t it? No matter where you are there is always going to be some sort of challenge. And so maybe it’s more important to embrace and thrive in what feels natural, easy, and normal. My daily life here feels normal y’all. Fetching water, using a latrine, sleeping in a mosquito net, shopping at market, putting hot water for tea later in my thermos, wearing a bandana “African style”, and washing my dishes in a basin feels utterly and completely…standard. I don’t even think about it anymore. And now that I’m doing all of this and somehow playing “mom” for the next week is honestly, like, super fun. I like checking in with the girls to make sure they get some sleep, I like cooking for them, I like making them tea, and I like providing water and soap so they can wash all the times they want. Maybe it feels extra good because so much of my time here has been me getting taken care of; now, I’m finally able to hold my own when it comes to living a semi-Rwandan life. The girls have been staying up late to study and I have been an old woman and retiring to bed well before they do. They have been sharing a mattress in my living room and I’ve been sleeping as per usual, in my bed. To go outside they must pass through my bedroom and last night I woke around 4:00am to them slipping through, failing in their attempts to whisper. I followed them outside and low and behold, they were crouched on the ground ferociously trying to gather these flying insects that look a lot like fireflies. Um. What are y’all doing? I asked them. Minus the y’all, of course. Turns out, sometimes after big rains, these particular insects increase and fly around, particularly in areas of light (they were hanging around my light bulb outside my house). The girls, and almost all of the neighborhood, were collecting these bugs into a bowl so they could cook them later. Yep, cook them and EAT them later. I bowled over in laughter, is this seriously my life? I crawled back into my bed with a smile on my face. How is it that this life is so much a part of me now? How is it that I feel totally and completely a part of things? How is it that I can be completely myself with these girls? That I can take care of them (as they have taken care of me) and it feels like we’ve been in each other’s lives all along? For this time though, I don’t think about making the adjustment from this kind of life to life back in America. I don’t think about what it will feel like to say goodbye. I don’t think about what it will be like when the comfortable part of this is over. I don’t think about any of this. I thank God, over and over again, for making this place my home. I’m realizing more now than ever, I somehow, somehow belong. I’m a far cry from being a Rwandan or a true villager, but in my efforts to try and try try again, it worked. I’m coming full-circle only this time instead of making a place a home, I’m just existing in the home that I have already built. I’m blessed enough to have my Rwandan family members alongside me. Maybe sentimentality is starting to take over or something, but with each passing day that I keep house, easing into the day, waiting for the girls to come back home, I keep thinking of how right it all feels. I’m glad my ending will be like this. It will be about being home. Fidele reads from a short-handed list of the things he has interpreted as my successes while in Ruramira as a teacher, Peace Corps volunteer, and community member. I nervously smile, nod my head when appropriate, and listen as he describes to our student body, teachers, and administration what my two years have added up to. He touches on the tangible things: he talks about the improvement of students’ ability to speak the English language (or at least try), he gives great gratitude for the sports project, and he commends the objectives and achievements of Ruramira Secondary School’s GLOW Club. He continues to describe what he feels are my most laudable personality traits: I am a umunyaukuri (a person of truth), a hard-worker, punctual (Lord knows any American could be in this culture), and he says that he can see that everything I do comes from the fact that I love people. He chuckles and proceeds to tell the student body that I actually know more about the inter-workings of families in our community than most due in large part to the many home-visits I have completed. I’m humbled and proud of his assessment; if this is what he can take-away after two years, then I certainly have demonstrated the values and characters in which I try to live my life. Moreover, Fidele, perhaps more than any other co-worker of mine, has seen me at my worst. He has seen me when I have been angry and unforgiving to Rwanda. He has seen me act cold and distant when I’ve been unable to culturally adjust. He’s seen me cry a handful of times when I lose words – either in English or Kinyarwanda – to describe the frustrations I feel. And yet, he can still say such nice and warm things. I smile and also sigh heavily; I really don’t know how to do this. We are at my goodbye “party” which is taking place on the last day of term III and thus the last day of the 2013 school year. 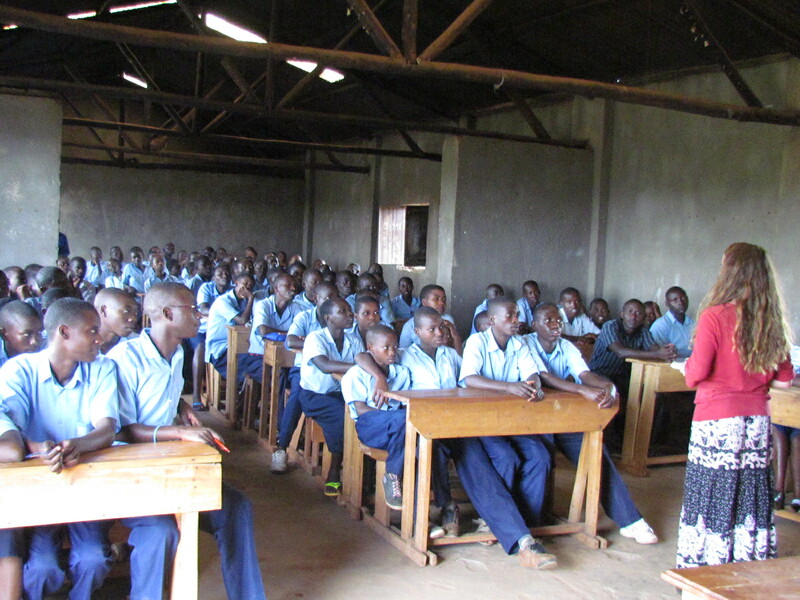 The students have moved a great number of desks to one of the school’s large, open rooms, and they are smushed together – so they can listen to the speeches that are an ever-present part of any Rwandan gathering. The program is relatively simple: Fidele speaks, some of the girls sing and dance for me (traditional music, of course), Headmaster commands each class takes a photograph with me, Headmaster speaks, and finally, I take 5 minutes to speak the last words I will speak in front of these students. Hello my dear headmaster, DOS, Jessica, and all the wonderful teachers. Hello my super students – ugire amahoro (peace be with you)! Today I am happy because we are together. Ariko (but), I am also sad because today will be our final day as a group – it is our last warning. In a short time I will go back to America. In America I will see my beautiful family, my dog, and my home but I will miss Ruramira greatly. Nzakumbura imisozi, nzakumbura abakekuru, nzakumbura ibitoki kandi ubugari cyane pe, nzakumbura umuco mu Rwanda, ariko nzakumbura i Ruramira cyane cyane cyane. (I will miss the mountains, I will miss the old mamas, I will miss bananas and cassava bread a lot, I will miss the culture of Rwanda, but I will miss Ruramira the most). Namukunze cyane. Namukunze kandi nzakomeza kugira urukundo kubera mwese mufite umuco mwiza. Mufite umutima mwiza. (I have loved you greatly. I have loved you all and will continue to have love because all of you have a good culture. You all have good hearts). You have the motivation to increase the life for you, your family, and your country. To be a teacher in Ruramira was difficult in the beginning ariko now kumererwa neza (it is very comfortable). Noneha (at this time), Ruramira ni wacu (Ruramira is the home for all of us). My favorite time in Ruramira was at this school. The best days were teaching songs from America, watching you students show theatre, helping GLOW club, and coaching football. I will never forget those times and all of you. Sinshobora kwibagirwa (I could never forget). I hope in my 2 years I was able to help you do something. Birashoboka (perhaps), the English for you has increased. Birashoboka, you had the improved opportunity to play sport. But most importantly, I hope I helped you to find icyizere (confidence) and the belief that yego washoboye (yes you can)! My goal as a teacher was also to be a friend, an umujyanama (counselor), and a supporter for you. All of you students have the ability and power to have a good future – but it starts with you. Thank you for sharing your hearts, your ideas, your love, and your home. Thank you for helping me to be an umunyarwandaikazi (Rwandan women). Ushaka inka aryama ntayo (Rwandan proverb: if you want a cow, you must lie like it). Thank you for making Rwanda a special part of my life forever. I will always remember this excellent place. One day I hope to come back and visit and see you students as leaders for this country – because yes you can. I am sad to go. Ndababaye cyane kubera umutima wanjye iri i Rwanda na Amerika. Ntakobwa ariko kubera Imana. (I am really sad because my heart is in two places; Rwanda and America. I don’t have fear though, because we have God). Turi (we are) together in the spirit. Imana ikomeze kubaha umugisha. (May God continue to bless all of you). After I finish, my goodbye is over. It’s that simple. The school has a plan to continue to distribute the students’ reports and because we are over 2 hours late, we must move quickly. The top students in each class are announced and the class teachers call the names of their students so that they can see the results of how they performed for the entire year. Disorder creeps into the school day and so it makes a long-drawn out goodbye impossible. Students are everywhere. Some still need to pay school fees. Some want the village photographer to take a photo with myself and them. Some just want to return back home. I loiter for a while, but eventually, I resign myself to the small bar not too far away from school. Our headmaster has arranged for school sponsored fanta, beer, and goat meat (brochettes). um hello. That was the last time you will see most of those students. Ever. As usual, I was on a run when this thought finally made some connection in my head and heart and I had to stop running for a few moments. My students were the ones who taught me. My students were the ones who became my friends. We had our ups and downs, my students and I, but I could never relegate their influence in my life. Many of them live in conditions that some of the world could never understand. I will never ever be able to reconcile why does the world work this way? when it comes to piecing together the circumstances that life has dealt them. My students were the best thing about living in Rwanda. And maybe what I dislike the most about goodbyes is that there are never enough words. And the words you use don’t necessarily convey exactly what you want to say. You try to explain further in detail, but it’s almost as if the more words you use, the less expressive you feel. So that speech above? Yeah, I think it covered most of what I wanted to say. It hit the right mixture of the two languages I have been speaking for two years. But, I wasn’t sure if my students walked away knowing just how grateful I am for their presence in my life. 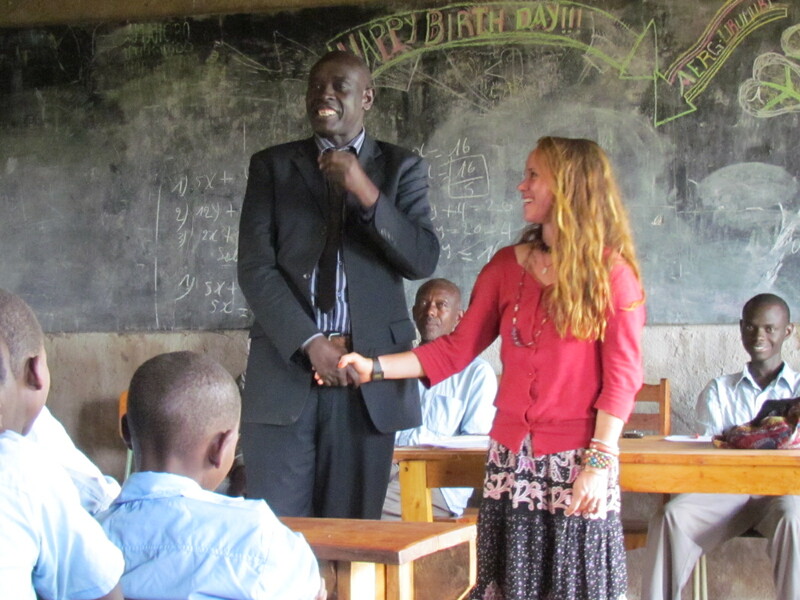 The school goodbye marks a final transition and shift regarding my Peace Corps service. Now, my primary assignment is officially completed. I’m done. As November nears, I am more and more aware of the time remaining. I have 6 weeks left in Rwanda. This phased goodbye process is great in that you feel relatively stable as it goes. Yes, goodbyes are difficult, but slow by slow you can build the closure you need to really bring things to an end. That’s essentially what I am doing the last 6 weeks I am here; slowly saying goodbye. I have to admit, I am a little afraid of what it will feel like in the final hour, when it really is all over. I’m afraid because the down-side of spacing out goodbyes as such is that when you’re finished, that’s it. You are forced to look at life change in the face and accept it without question, hesitation, or delay. Divine recently moved in with me for the next month in order to be better located for the national exam she will take, to help me pack, and to accompany me on what I have dubbed my Goodbye Tour. Nearly all of the Peace Corps Volunteers in my group will leave in early November and so Divine was adamant that my last days are not spent alone in my house. I am so grateful for this decision as it’s been like having a sleepover each and every night; we talk late into the night and wake early in the morning to drink tea and coffee. I then read from the Jesus Calling devotional (thanks Grandpa and Glenda!). At the end of the small devotional blurb, she reads the provided scripture in Kinyarwanda, I follow by reading from my English bible. Most of all, after living relatively alone for two years, it’s an amazing thing to have someone else around – to share meals, to chat, and just to have the company. The routine of her presence has provided a level of comfort that I never knew I could have in a country so far from my own. It’s this, I think, that scares me the most about saying the REAL goodbye in over a month. I can say goodbye to my life as a Peace Corps Volunteer, I can muster a teary farewell to my village, and as I have already done, I can make peace with having finished my job as a teacher. But, say goodbye to that kind of friend? Say goodbye to the intangibles that a friendship like that brings? We both are aware it is coming and we touch on it from time to time, but never too long. Perhaps it’s a state of denial, again, I don’t know, but I figure it’s okay because it’s making my last days enjoyable, memorable, and a fun part of this journey in Rwanda. This is all mutually exclusive from the joy and excitement in returning home, obviously. That feeling and anticipation is 100% present throughout the process of goodbyes as I remember that I’m lucky to have something so wonderful to go home to (namely, family and friends). And so, it’s a matter of clinging strongly to our beliefs, our relationships, and the experiences we know to be true that make goodbyes bearable. I personally believe that God’s hand and love are most visible in times of transition and change; if He got us there in the first place, then surely He will put us right where we need to be. And, if he has continually put amazing people in our lives then that is forever. You may not get the people you want in the physical sense, but they change your lives for the better and you keep that always, no matter where you go. It’s not easy, it’s not always ideal, but it’s the reality. When you become best friends with a person you don’t always know what they will bring. 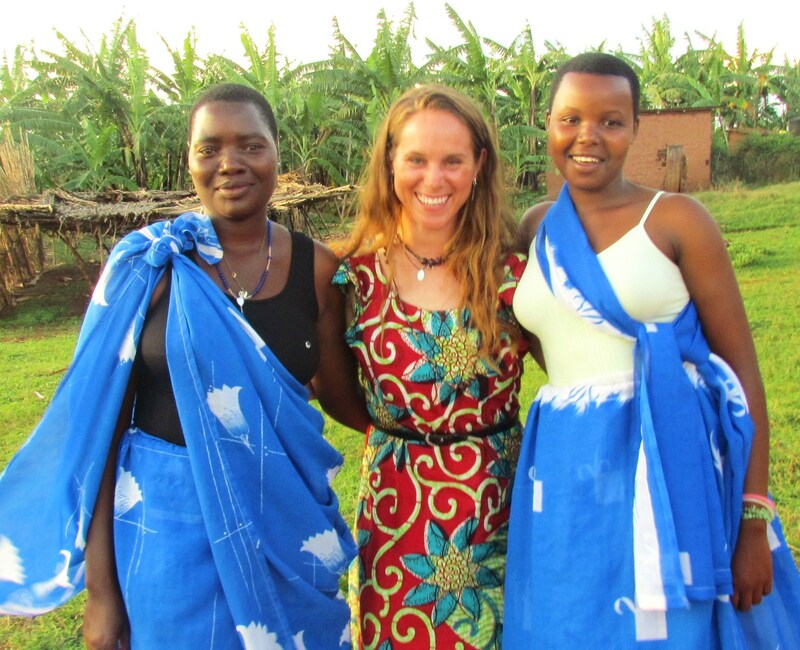 In foresight, I could never have known what Rwanda, Peace Corps, my school, or Divine was going to do for my life. Now, I’m starting to get an idea and I’m humbled, grateful, and happy with what I see and feel. I’m continually blown away. Hindsight is a beautiful thing. You see God’s hands in all that He has touched and orchestrated and you are unable to fathom at just how awesome it all is. Here’s to one last, final month. May it be full of laughter, memories, and a solid foundation to say a necessary goodbye. It’s these goodbyes that will lead me into the next chapter, a chapter that is waiting back home with more incredible people that God has so infinitely blessed me with. bananas outside the ceremony. i am going to miss the banana trees. so much.